THE BIGGEST MOVIE IN THE WORLD! AWESOME, POWERFUL AND TRULEY EXTRAORDINARY, ONE OF THE BIGGEST MOVIES IN THE WORLD, PREPARE TO BE AMAZED, YOU WILL BE BLOWN AWAY!! Fifth film in New Line's Tolkien trilogy lacks focus. Ian Holm's Bilbo is fine as usual, but Benedict Cumberbatch's dragon is a disappointment. Amazing!!! Great action and story line that matches the book. Amazing, Peter Jackson has wowed us once more with the second part of the Hobbit trilogy. I loved it... and would definitely recommend it.... of course I like the Lord of the Rings Trilogy.... so I loved it... Plus I am an Orlando Bloom Fan... and glad he was BACK!!!! A bit sad that they've given in to the notion that plagues most CGI-involved series sooner or later - that the CGI is an end in itself. Even the most amazing CGI, when piled on for too long, gets boring. Worse, it becomes cartoonish. This movie also lost the humour that was such a part of the LOTR movies. And lots of plotlines fresh from TV, with cliched dialogue to match. Sad. Won't bother with the 3rd one. Better than the first. I've seen it in theatres multiple times. Richard Armitage's performance is amazing. I liked the first one better. Wasn't too bad though. bad, bad, bad!!! Slow moving - not as bad as the 1rst but overly long for the amount of story. Fight scenes were very unbelievable even for a fantasy movie. Won't be wasting my money on the 3rd movie that is a given. overly long and drawn out. Fights scenes were too contrived and beyond belief even for a fantasy world. Wasn't overly impressed with the first movie, no better with this one, won't waste my money on the third. The dragon just wasn't convincing. Disappointed. Lacked originality, many scenes reminded me of other movies. The ending will not bring me back. I'm a big fan of the LOTR trilogy but I'm finding myself indifferent to the Hobbit movies. The story feels uninspired and bloated and the characterization lacking. I also didn't care for the decision to end the movie on a cliffhanger rather than let the movie stand as a complete chapter of the trilogy. Excellent movie......can't wait for the next one. No comparison to the "Lord of the Rings" Some of the special effects dated the movie I think. Smaug should have stayed in the deep of his darkness. The storyline lacked depth. The thing the irked me the most was the fact they ended the movie at the climax of the storyline. What was that? Mmmmmm.....cheap money grab. Won't be back for the final sequel. Although different from the book, it was entertaining from beginning to end. I enjoyed smaug the most. Could not stop smiling. People who complain about the ending don't realize that it is not the end of the story. The third one will finish it. All things considered this is a decent movie. 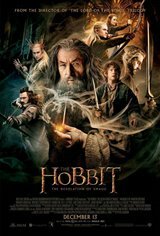 I'll admit when I found out they stretched the Hobbit into 3 movies I was angry at the money greedy Hollywood executives but now after seeing the movie they have done a great job on extending the story line. Also well done on the Computer Graphics. There are a few drawbacks but an enjoyable ride. Slickly done unrelenting violence from beginning to end. Must have been sponsored by the American Military to teach our children that killing is okay. Because of the sick message of this film, I won't be seeing ANY movie any time soon. Fantastic, best of the best - I think it was very creative to deviate from the book in this part of the journey to keep up with time. Very well thought of - brought life, fun, much more excitement to enhanced the story. I felt like we were back in the swing of it....it reeked lord of the rings and I loved it! Best movie of the year I think!! 10 times better than any other 3 movies combined. The level of detail and creation that went into it is wow, wow, wow. I can't spell words long enough to describe it. It was a great movie. I loved it! I watched the second installation of the Hobbit series tonight, thought it was just okay. Didn't hold up to the standard set by the Lord of the Rings series or even the fist of the Hobbit series. I particularly wanted to comment on the 3D AVX presentation and say that it really cheapened the cinematic experience. It lacked depth and in many instances just looked fake. This movie is pretty good although not as great as Lord of the Rings. Totally felt ripped off by ending?? Enjoyed the first movie. It stayed fairly true to the book. The second movie they changed Tolkien's story line a lot. The scene in the Lonely Mountain should have stayed strictly between an invisible Bilbo and Smaug. By adding the horribly done fight between the dwarves and Smaug it ruined the movie for me. Really hope the third movie improves on this for the final battle. Very entertaining!! Fantastic movie with an excellent plot. Fantastic movie! I wouldn't expect anything less from Peter Jackson. Was a little long with lots of extra stuff added, but still great. Of course, everything that happens is always at the last possible fraction of a second and of course main starts don't get hurt but they can flip and jump off and through things with ease. But the white water barrel scene looked like a fun video game. Loved all of the action. Very well done and a bonus for all of us dragon lovers. Nice to see Orlando Bloom back as an elf. The movie is way too long to start with. Pretty much the whole story line has been completely rewritten from scratch with only the major settings being used (Last homely house, Elven forest, Laketown and the Lonely Mountain). Save your money and watch the Lord of the Rings again, since this is pretty much the same movie... I definitely suggest this if you have read the book before. Write a letter to scotiabank if it bothers you that much, I would delete your comment since it has nothing to do with the movie. Dumbass getting headaches in a movie theatre...get your eyes checked quick! After 45 horrendous minutes of nausea inducing ad after ad, with a break halfway, for a Scene points game, the previews started then finally the movie. I did not enjoy the movie due to the headache I had. I will never go back to that Scotiabank theatre ever again. The first one was pretty slow moving. This 2nd installment sprints along nicely for the most part. Good bits of action if not overly fantastic. The dragon is well done! My biggest peeve is the elves are a bit too superhero compared to the LOTR counterparts. Ah so you "like" little people do you? Perv. On another note, anything with dragons is worth a see.